I'm excited to finally be able to share a preview of the winter issue of Artful Blogging Magazine, where you'll find a feature on yours truly inside. 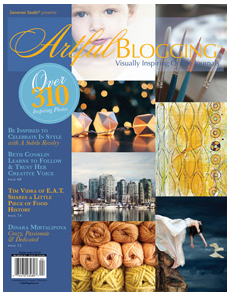 I was thrilled to be asked to be a part of this issue by the amazing folks behind Artful Blogging and it's been a project I've been keeping behind the scenes here for a little while until the release date was set. 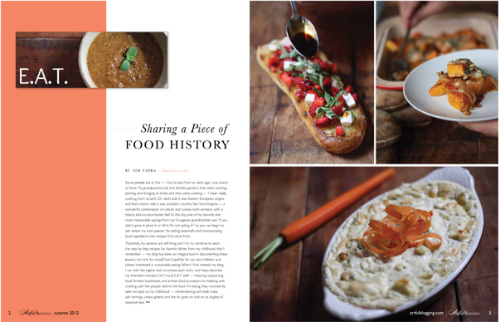 You'll find a little back story on me, my history with food, tips for blogging and of course a spread of food photography from right here in the E.A.T. kitchen. Look for the winter issue stand release coming November 1st or go ahead and preorder your issue here. I will be excited to share more details on the feature after the release coupled with a giveaway of this issue just in time for the holidays! Bravo - you deserve it - Congratulations! Go Tim! You so famous. Thanks Mollee I am a wee bit excited about this!